What is Star of the Sea (Kaisei)? The word “Kaisei” means “Star of the Sea” in Japanese, and it is also called “Stella Maris” in Latin. Stella Maris is widely known as an ancient title for the Virgin Mary. 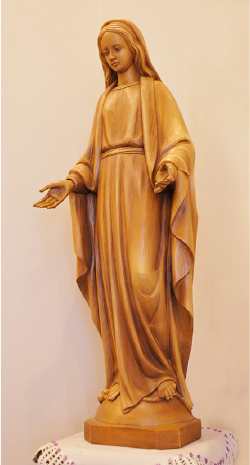 The Virgin Mary represents the spirit of our school. 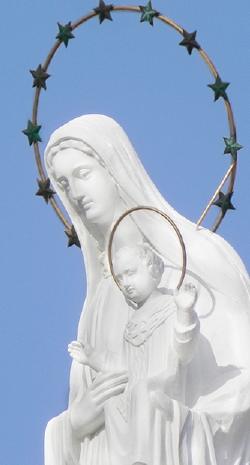 A statue of the Virgin Mary and Child stands on top of our school building, representing our spirit. A long time ago when compasses were not available, voyagers used stars to find their direction in boundless oceans. We are all travellers who travel through the ocean called life, there will not always be smooth sailing, but also be times of storm or lull. Kobe Kaisei Girls School would like to teach our students to follow the spirit of the Virgin Mary, Star of the Sea, so that they can find their direction in life at all times. Mary, the mother of Jesus Christ, is a symbol of love of a mother for her child. There is a scene in the Bible where Mary received an omen from an angel to become the Mother of God. Mary replied to the angel “May it happen to me according to your word.” This might be considered as being passive from a modern point of view. However we consider her answer to represent a complete trust in God and her proactive decision to accept her role. We would like to learn from Mary’s way of being; which was filled with love, trust and responsibility. 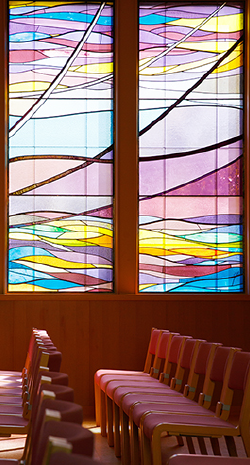 “Aiming at Truth and Love” has been a philosophical goal of Kobe Kaisei Girls' School ever since its establishment. This was the life vision of Marie de la Passion, who was the founder of Franciscan Missionaries of Mary (FMM). FMM was the founding organization of our school. Marie de la Passion was born in 1839 in France and dedicated her life to passing down the truth and love of Christ. She commissioned the members to travel to Asia, Africa, America, even to remote places where some risks were involved. In 1898, five sisters were sent to care for leprosy patients in Kumamoto, Japan. They dedicated themselves to caring for the patients and handing down Words of God despite of their struggle amidst an unfamiliar culture and language. This spirit was the beginning of our school’s educational philosophy. What do we mean by “Aiming at Truth and Love”? Through education we strive to get closer to truth, which means to reach God Himself, who is the source of Truth. It is important that truth is to be sought through love. That is to say, students will know that God gave them life and loves them, and also be able to find joy in doing service for others. There were no limits or boundaries for the founders of the global missionaries. We would like our students to develop international views just like those of the founders, to develop a positive attitude in life, and to become independent-minded individuals. 1. To pass down Words of God. 2. For the girls to become honest people. 3. To provide good education. She founded an educational institution: “Kaisei Girls' School” in Aotani, Kobe and established a primary school, junior and senior high school. Dedication ceremony of school building in February. Primary school building and a heated indoor pool were built. Established five-day week system in primary school, junior and senior high school. Audiovisual classroom for primary school, junior and senior high school was built. 40th Anniversary. Opening of new auditorium building in December. The Great Hanshin-Awaji Earthquake occurred. 50th Anniversary. Ceremony was held in November. Computer room for primary school was built. Media room for junior and senior high school was built.